I wished the grinding wheel came a little quicker but the snow storm out west delayed the delivery. I would have been good to get updates. The wheel was packed correctly with adequate pacing to ensure product safety. Bought this a while back to replace one I pretty much destroyed finishing ceramic tiles I had cut to fit a project I was working on. I realize this is not what the wheel was designed to do but it worked pretty well, however by the time I finished up with that job the wheel was Scarred and out of round because the wheel is so soft. In any event it works great for it intended purpose sharpening chisels ! For the novice Wet Grinder users I would advise to apply grease to the shaft to prevent the shaft rusting to the wheel. Also remove and re-grease at regular intervals. I purchased this grinding stone as a spare for my Jet wet sharpener, so at present I haven't tried it. I am considering purchasing one of Grizzly's wet sharpeners that this stone fits so either way eventually I'll use it. Have reordered another T20683 Grinding Wheel for my other Tormek T-6 machine. Yes, only about three threads into the Tormek nut - no problems at 100 +/- RPM. Not a problem. Saved about 175.00$ per wheel. Thank you, Mr. Grizzly for the savings. 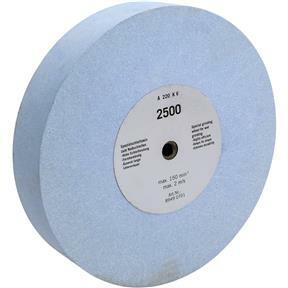 I received this replacement grinding wheel a few days ago, installed it and have sharpened several tools with it. The sharpener works GREAT! It's more than I expected! I am very pleased with this purchase and very satisfied with your prompt, no-hassle customer service. Thank you for a wonderful product and service. I am so glad I did business with Grizzly.